The Boom interview: Ron Nichols, Department of Water and Power. Uneasy lies the head of the Los Angeles Department of Water and Power. Before Ron Nichols was appointed general manager in January 2011, the nation’s largest municipal utility was run by five different men in five years. Before moving to LA, Nichols was a high-powered consultant to water and energy utilities, first with his own firm, Resource Management International, and then with Navigant Consulting. His speciality: putting together tough deals, selling them, and making them work. He knows government and politics, too, having held positions with the California Department of Water Resources and the California Energy Commission. He has a vision for the future of water and power. It’s not his alone. But he has made it his. Get Los Angeles off of coal-fired power. Expand the city’s renewable energy sources. Implement the largest home solar program of any city in the nation. And reduce the city’s reliance on imported water by capturing more stormwater in LA watersheds, cleaning up contaminated groundwater, and reusing treated wastewater, while convincing customers to go along with rate hikes to pay to keep up a century-old system and invest in the future. Nichols knows the territory. He knows it won’t be easy. And, yes, he has seen Chinatown. 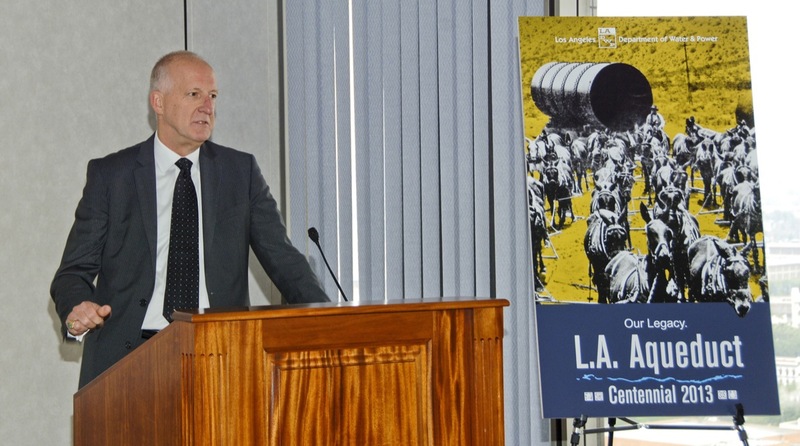 Boom spoke with him about the legacy of the LA Aqueduct and the challenges ahead. Boom: When we told people we were working on a special issue about the one hundredth anniversary of the LA Aqueduct, often the first thing they said was, “Oh, you mean, like, Chinatown?” Do you ever hear that? And how does that affect what you do? Nichols: When word first came out that I was being appointed to this position, I received a half-a-dozen copies of Chinatown from people, saying, “Oh, you have to see this movie.” Well, you know, actually, I saw it when it came out. It was a very entertaining movie. That movie is very loosely based on past events. I don’t think it depicts what William Mulholland did and what the LA Aqueduct is to Los Angeles. It’s a useful foil. It’s a good opportunity for people to bring out their perceptions of the aqueduct and the issues associated with the Owens Valley and juxtapose that against what has really happened and, most importantly, what we’re doing going forward. I think the better story, the real story, is a story of an incredible undertaking of unprecedented proportions to develop an ingenious supply of water to help create one of the largest cities in the world. That’s an impressive story. Boom: Is it true that most Southern Californians don’t know where their water comes from? Nichols: I think that’s true. It’s human nature to look at a tap as it provides me water, just like when you look at your light switch. You flick it on and have light. You don’t think about where any of that came from. That’s just human nature. Ron Nichols. Courtesy of LADWP. Boom: Where does our water come from in Los Angeles? Nichols: In an average year, about half of it comes from purchases from Metropolitan Water District. About a third of it comes from the Owens Valley through the LA Aqueduct, and the rest comes from water conservation, stormwater capture, recycled water, and groundwater. And the important thing is there’s very rarely an average year. And as a result, our water requirements in terms of what we purchase from MWD, imported largely from Northern California varies from 25 percent of our needs in a wonderful wet year, like we had three years ago, to 75 percent of our needs in a year like we’re having now, with two back-to-back drought years. Boom: What does Los Angeles owe Owens Valley, if anything? Nichols: I think we owe them our attention in terms of how we’re using the water and how we’re planning to use that water, the effects that our use of water has had and does have in Owens Valley. I think we owe them respect. And I think they need to understand the role that the water that we bring from the Owens Valley plays in Los Angeles and how important that water is to a city of four million people. There has been a century of difficult relations between the Owens Valley and LA. You don’t change that overnight, but we’re working on it. Boom: Can the DWP make peace with Owens Valley? Nichols: I guess it always depends on how you define peace. We’re working much better with Owens Valley than we have in the past. There is not a monolithic Owens Valley, though. There are agricultural users up there who would like to see more water for their use in the valley. There are persons who are very pleased that it hasn’t grown like a big valley town in the San Joaquin Valley. There are the tribes up there who are concerned about the impacts of development on their lands up there. So you can’t just paint Owens Valley with the same brush. There are those who are concerned about dust impacts. You can’t solve all of those interests simultaneously. And all of those interests themselves don’t necessarily agree with one another. But we’re doing our best to try to find a way to be better partners. And a perfect example is what we call our Owens Lake Master Project. We will spend hundreds of millions of dollars on doing a better job of mitigating dust with less water, while enhancing the environment for waterfowl and aesthetics—if we’re allowed to do it. Boom: So what are the parts that you’ve not been allowed to do that you would like to do? Nichols: Rather than have a well-established comprehensive plan on how you’re going to do that—that is, mitigate the dust on Owens Lake—it comes to us in large bite-sized pieces, obligations, with very tight deadlines. If we actually knew what the overall plan was going to be and where, we could come up with something much better. We could come up with something that doesn’t waste 95,000 acre-feet of water a year on mitigating dust when there are things that can be done without using anything close to that much water. We could do something that environmentally looks better in places where we could put water that works for waterfowl. Boom: Can the new mayor Eric Garcetti play a role in making peace between LA and Owens Valley? Nichols: No one has to put a gun to our head to say go up there and cooperate with the people in Owens Valley and the Great Basin Air Pollution Control District. We’ve extended our willingness to do that, but you need to have a willing partner on the other side. It takes two to tango. Boom: Could shuttle diplomacy help? Boom: Is the LA Aqueduct going to become less important or even more important in the future? Nichols: I believe it will be even more important in the future. It was obviously vitally important at its birth to provide the volume of water that was necessary to build a city on. Fast-forward a hundred years: We’re not going to be growing massively going forward. We’re certainly not going to be using a lot more water. But it’s important to have some diversity of water supplies to have a reliable supply, and the Owens is an incredibly important piece of that and I think will be even more important going forward. Boom: So why is water from Owens Valley even more important going forward? Nichols: It’s important for us to be able to have a supply that we uniquely have rights to. There are three legs to the stool for our water supply. There’s Owens, there’s what we get from the Metropolitan Water District, which is 80 to 90 percent in normal years from Northern California, and there’s what we do locally here within the city. If we know that we’ve got those two other legs of that stool, of MWD and Owens, then we can set upon the investments that we need to do to try to firm up our local supplies through conservation, cleaning up our contaminated groundwater, stormwater capture, and recycled water. If there were uncertainty about whether Owens is going to be there, I’m not sure where we’re going to get the water that we need for a city of four million people. Boom: If money were no object and you were the king of water in Los Angeles, how would you change our water system? John Ferraro Office Building, LADWP headquarters. Photograph by Joshua Llaneza. Nichols: There are two pieces of that. There’s the infrastructure that delivers to our customers and there’s the supply. On the infrastructure side, it would be wonderful not to wake up every day to a water break in our system. So I would love to be able to replace all of our aged pipes and pumps and other things to get us up to a totally modern distribution system. On the supply side, I’d like to be able to focus on cleaning up the groundwater aquifers in the San Fernando Valley. Get rid of those industrial solvents that came there in the World War II and post–World War II time frame, so that the water that’s there can continue to be used reliably and sustainably. That’s an important supply. I’d like to be able to complete the Owens Master Project to reduce the amount of water that we are using for dust control. And I’d like to be able to find a way to take highly treated water out of all of our wastewater and use that and put that into our groundwater aquifers to have that be a bigger piece of our long-term supply. All of those things take a lot of money, unfortunately. Boom: But all of those things are actually in your plans. Nichols: Yeah. I’d like to get them done tomorrow. Boom: So how do you persuade the public—your customers—to support those kinds of investments when it means higher rates for them? Nichols: It’s an education effort. And it’s something we’ve been doing over a number of years. I have spent, personally, a lot of time on it, over a year and a half, working through, identifying what our near-term water requirements were, to explain to people first, here are the supplies we have. Here’s the condition of our infrastructure. Here are our needs. And here is how we need to be able to do these things, both to meet regulatory requirements and to do it more sustainably and more wisely. I think we get substantial support for that in that process. But to get people comfortable with putting money down monthly to do that, it needs to be tangible. Tell me the project. Tell me exactly what you’re going to do. Show me that you’ve prioritized this in a way that makes the most sense, that you’re doing the best things first. We owe that to them and we’re doing that. Boom: But we often hear people say, “That’s not what it’s about at all. It’s about the unions and their pensions.” How do you respond to that in public meetings? Nichols: The question of the unions at DWP and our costs for labor get raised early and often. And I think people need to understand that, number one, unlike, say, the rest of the City of Los Angeles, where 90 percent of their costs are labor; 25 percent of our costs for LADWP are labor. So it’s not a big driver of our costs, and as a result, people aren’t going to be seeing rate increases because of the demands of our unions. Do we need to make certain that we’re being prudent in dealing with our unions and that we’re making certain that we’re not overspending? Of course. I think it’s very important to make a differentiation between DWP and DWP’s largest union. They’re not the same. DWP does play a meaningful role in city politics, but it does so by virtue of providing two phenomenally important commodities that make cities survive: water and power. And on the water side, it’s particularly important when you have a city of four million people living in an arid area that relies on water that doesn’t largely come from within its borders. Making certain that there’s water there and there’s power priced at a level that people are willing to pay and changing from a fairly high carbon power supply to a sustainable one are big issues. They’re important issues, and they loom large on the political horizon down at the city council and should. These are important issues for a city. They’re important issues for society. So, in that regard, DWP utility does play a significant role in politics. DWP, the utility, has nothing to do with elections. We don’t spend any money on elections. We don’t take positions on candidates. The union has taken its position. And they’re free to do that. And there’s been a long legacy of IBEW influence with respect to elections. I don’t have any say over that. Unfortunately, I think both the media and a lot of the public have difficulty making that separation between the union and the department. That’s unfortunate. Boom: The other part of your portfolio is power. How do you balance the two, water and power? Nichols: Both water and power systems are going through this phenomenal change at the same time. And it’s all about a combination of aged infrastructure and sustainability. We’re making huge changes on the power side as we move off of coal, as we help our customers use less energy and use it more wisely, as we ramp up to at least 33 percent renewable energy, as we rebuild all of our coastal gas-fired power plants to quit using once-through ocean cooling, we’re completely turning this utility upside-down in twelve or fourteen years. And that’s a huge process. But we’re doing the same thing on the water side. We’re covering all of our reservoirs. We’re rebuilding our pipelines. And we’re having to regularly recondition the LA Aqueduct. We’re spending billions of dollars on dust mitigation up on Owens Lake. We’re putting an incredible amount of money into recycled water and stormwater capture and pumping up our funding for water conservation, all at the same time. It would be wonderful if we could do one and then the other, but we can’t. So they pretty much occupy about an equal amount of my time. Boom: Thinking about the future of water and power, it seems that we might reasonably expect new disruptive technologies that could substantially change how we generate energy, store it, and use it. But in water, not so much. Nichols: Clearly, and there’s a reason for that. You get water from where it exists. We have a fixed amount of water on this planet. We haven’t found a way to manufacture new water. But you can manufacture electricity lots of different ways. As a result, the technological opportunities on the power side are significantly greater. Anybody who says they know fifty years from now what we’re going to be using to produce energy is crazy. Whereas on the water side, we know where our water is going to come from. We just need to prioritize our planning and our spending for it. If there were one technical area that I wish someone could come up with, it would be to have every multifamily home, unit, have its own individual water meter. Sixty percent of Angelenos live in multifamily homes. And the vast majority of those multifamily homes are in large enough structures that they don’t have a separate meter for each dwelling. They don’t have anything that causes them to pay directly for the water they use. And it’s very tough to replumb buildings. If somebody could come up with a way that could measure that water use at the point of use in multifamily buildings, to give a price signal to all of those customers to conserve more, that would be a technological difference. That would make a difference in this city. Boom: How will climate change affect our water supply and what are you doing now to adapt to those changes? Nichols: I’m one of those that believes climate change is real. We’re going to have greater heat that’s going to put potentially greater demand on water unless we change how we use it. And we’re going to have less water available. Or when it does come, it’s going to come in less of an even flow year-to-year than we had in the past. Those are big challenges. That’s one of the big drivers of why we decided to try to accelerate by a decade our local water management goals, because we think time is not on our side. And changing how people use water, and using and reusing here more locally is really important. There’s not a lot we can do about what it’s going to do in terms of changing the availability of supply, but we can change how wisely we use it. Boom: A big chunk of LA’s water comes not from Owens Valley by the LA Aqueduct but from Northern California through the State Water Project. There is a terrific debate brewing about the future of that water supply, restoration of ecosystems in the Sacramento-San Joaquin Delta, and a new conveyance system of tunnels under the Delta to bring freshwater into the State Water Project. What are your thoughts about what’s happening now in the Delta? Nichols: I personally think the future of California, not just Southern California, depends upon resolving that issue and providing through that project or something similar to it, not more water—that’s where I think the misnomer is—not more water, but more assurance of the reliability of that water being there, irrespective of what climate change issues might be. I think it’s most important to Southern California overall, but speaking for Los Angeles, I think it’s critical that we know what we can reasonably expect to get from Northern California for at least the next century, and right now, given the uncertainty associated with environmental problems that are there, the impacts that could happen from a major seismic event, we don’t know. And that’s not an acceptable circumstance. Boom: How should Los Angeles think of its role in the Delta? Nichols: I think it’s important that we communicate in Sacramento that we have done an excellent job on water conservation in Los Angeles. Most people don’t realize that we use the same amount of water today cumulatively as we did over forty years ago in 1970, and yet we have more than a million people more than we had then. That’s pretty darn impressive. We’re going to continue to do an increasingly better job of our water use down here. We’re going to continue to get the squeal out of the pig of the water that’s available in Los Angeles. But we can’t be cut off from that supply. The city will wither. And I believe that there is a good solution that works for Northern California and Southern. This is speaking for somebody who spent thirty-five of my years living in Northern California. The common belief, if you read it in the media, is that it’s a big water grab and we’re trying to increase it more for wasteful uses. In Southern California, nothing can be further from the truth. We have to get that clear message out to debunk that myth. I’m a water skier, and I’ve spent a lot of time up and down all over that Delta and used to be a fisherman up there as well. I’m not going to profess to be an expert on the Delta ecosystems. But from everything I’ve seen—and I’ve followed this issue for thirty-five years, back when I used to work for the first Brown administration when I was at the California Energy Commission, then the California Department of Water Resources in the seventies—that a solution like this is needed. We can’t continue on in the same fashion right now. It isn’t environmentally sustainable for the Delta. It’s not adequate for the reliability of water supply for Southern California. And this fix seems to be the best fix that I’ve seen in the thirty-five years or so that I’ve been in this business. And if it doesn’t work this time, it’s going to be a difficult challenge to try to do it again at a point in time that I fear is going to be a time when it has reached such a dire problem that it would be hard to get done in time. This interview was conducted and edited by Jon Christensen. 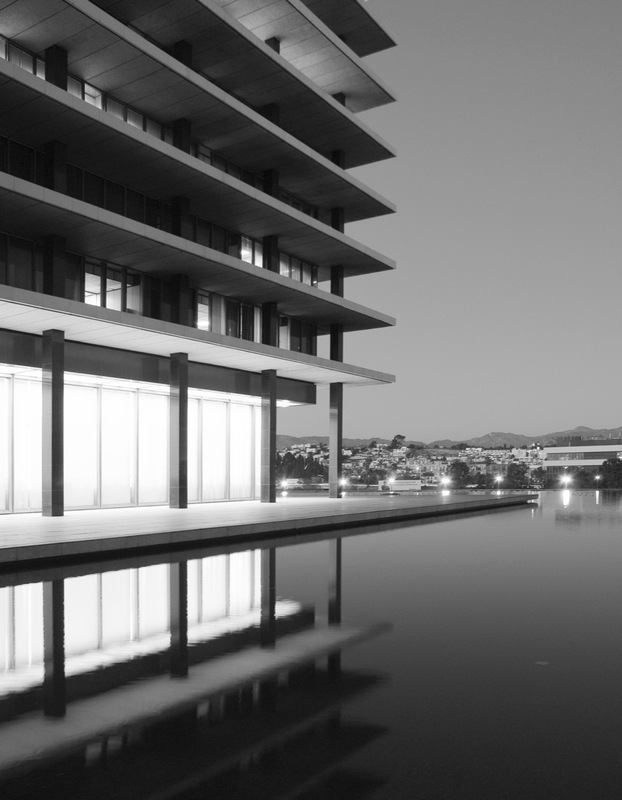 Photograph at top: John Ferraro Office Building, Los Angeles Department of Water and Power headquarters, by Abhijit Patil.